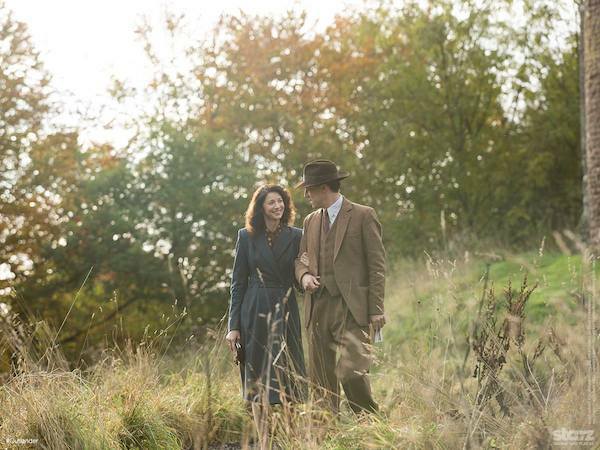 So, remember yesterday when we shared that new Outlander photo of Claire and Frank together and we speculated that maybe this was a hint that Starz would be dropping a new Jamie photo on us for Valentine's Day? Well, we'd be basking in the glow of that accurate bit of wishful thinking right now, if we weren't too busy basking in the glow of Jamie Fraser looking lit up by firelight as he presumably has his wounds dressed by Claire. The second half of that description is more of a guess, as the head of the woman standing behind shirtless-Jamie has been cropped out, but given that we know Claire's a nurse and Jamie does tend to have wounds that need care every once in a while, it may be a safe assumption to say that's Claire. In fact, tending to Jamie's wounds is one of the first things she does with him, though I'm going to guess that's not what we're seeing here. If this is their first encounter then it would appear they've gone a different route in terms of his injuries. It's also possible she's looking at the scars on his back. Regardless, Happy Valentine's Day, Outlander fans! Starz shared this pic on the Outlander Facebook page over the caption "Is it us, or did it just get a little hotter under our corsets?" Those who've read Diana Gabaldon's Outlander know that the story follows Claire Randall (Caitriona Balfe), a World War II combat nurse who's on vacation with her husband in Scotland when she finds herself suddenly thrown back through time and dropped in the 18th century. She's eventually forced to marry Jamie Fraser (Sam Heughan), a gallant young Scottish warrior. Of course, Claire's situation is complicated by the fact that she's not only out of her time, but also already married. And that inspired us to talk a bit about the nature of Menzies' characters, as he's not only playing Claire's husband Frank, but also Frank's ancestor Jonathan "Black Jack" Randall, who's one of Jamie's nemesis and not the nicest guy. Read all about that, along with some interesting (and spoilery) things series creator Ronald D. Moore had to say about the Starz drama here. New photos are a great treat for Valentine's Day. Fans also have the previously released trailers and speak Outlander videos to enjoy while we wait for this series to arrive, which is expected to happen this Summer.